The gentleman being forced to the ground by no less than five British Transport police in the video above is a 65-year-old pensioner named Tony Nuttall, who had been attending a peaceful protest against cuts to travel passes when the incident took place. At the same protest, against cuts to free travel provision for pensioners and disabled people, Sheffield Star reporter Alex Evans was warned to stop filming the events and erase all his footage – including potentially important video evidence of the violence, because he did not have permission to film in the station as it is private property. When he resisted the request, he was told he could be arrested under anti-terrorism laws. James Mitchinson, editor of the Star, told The Guardian: “To cite anti-terror laws is clearly nonsense. “But this case illustrates just how difficult it can be to report the news, on the spot when, increasingly, authorities are seeking to ‘manage’ it. “This wasn’t a PR stunt; it was an extraordinary event that couldn’t have been predicted and it was very much in the public interest that people were made aware of what was going on. George Arthur, aged 64, and Tony Nuttall, 65, have been charged with failure to pay and obstructing police. 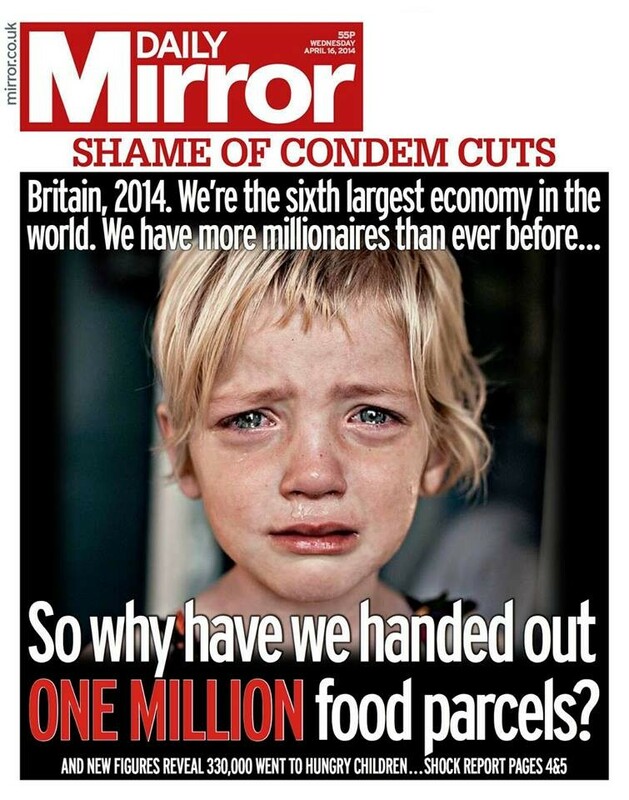 Britain’s shame: The front page of yesterday’s Daily Mirror. So the United Kingdom now houses more millionaires than ever before – but at the huge cost of forcing hundreds of thousands of people to seek help from food banks or starve. This is David Cameron’s gamble: That enough people will profit from the misery of the huge underclass he has created to vote him back into office in 2015, to continue his attack on anybody who takes home less than £100,000 pay per year. Are you really that selfish? Do you think this is any way for a civilised, First-World society to order itself? No – it’s more like the description of the Third World that became prevalent towards the end of the 1960s: A country with low economic development, low life expectancy, high rates of poverty, and rampant disease. They are also countries where a wealthy ruling class is free to exploit the population at large who, without money or force of arms, are powerless to stop them. Let’s see now… The UK definitely has low economic development. Neoliberal governments since 1979 have decimated our industrial base and the so-called recovery we are currently enjoying has yet to show any worthwhile results, despite the dubious rises in employment and wages that are making headlines this week. Low life expectancy? Yes, we have that. People in lower-class residential areas are expected to live only a few years into their retirement, if they make it that far, while those in rich areas may continue into their late eighties. Sharp readers will recognise that, although we all pay the same amount into the state pension, the rich get more from it as they live long enough to receive larger amounts. High rates of poverty? According to the Trussell Trust, the number of food parcels it handed out per year tripled from 346,992 in 2012 to 913,138 last year, with 330,205 going to children. Another 182,000 were provided by 45 independent food banks. The government says poverty is falling but bases its figures on a proportion of the median wage, which has been dropping for the last six years. This means government claims that worker wages are rising must also be lies. Rampant disease? Perhaps we should not go as far as to suggest this is happening – but the British Isles have witnessed the return of diseases long-thought banished from these shores, like Rickets and Scarlet Fever, along with an increase in Tuberculosis. These are all poverty-related, as they are caused by malnourishment. You can thank your Tory government for forcing so many people out of work and diverting so much NHS funding into privatisation. 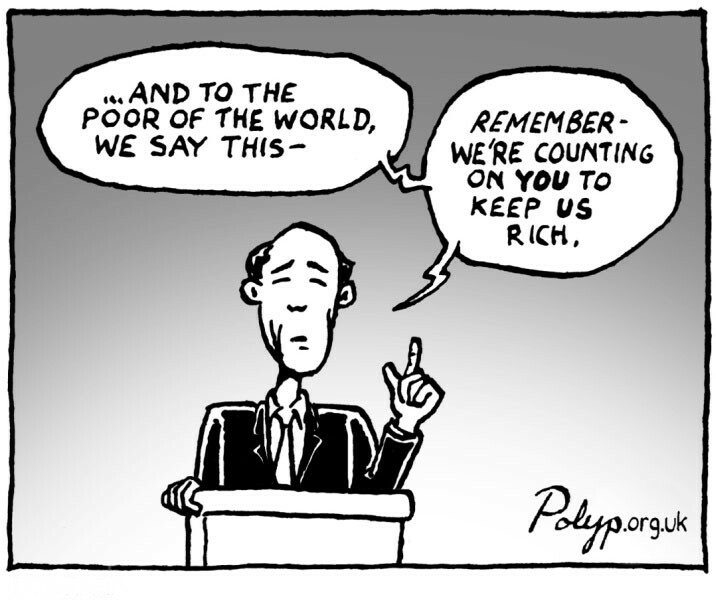 As for a wealthy working class exploiting the population – the evidence is all around us. Look at the reasons people are being driven to food banks, according to the Daily Mirror article from which I quoted the food bank figures: “Benefits cuts and delays, the rising cost of living and pay freezes are forcing more and more people into food banks, experts have long warned.” All of these are the result of Tory government policy. The government is, of course, unrepentant. I had the misfortune to see Treasury minister David Gauke – who found infamy when he signed off on huge “sweetheart deals” letting multinational firms off paying billions of pounds of income tax they owed us – saying he was not ashamed of the huge food bank uptake. He said they were doing a valuable job and he was glad that the government was signposting people to them. Nobody seemed to want to ask him: In the country with the world’s sixth-largest economy, why are food banks needed at all? Of course, I’m not likely to persuade anyone to change their political allegiance over this. You all know where I stand and, besides, this blog is simply not big enough to make a difference. “A million food parcels. How did our Britain get to be so hungry? Our country, where even after the Second World War, we still had the ambition to feed our poorest people and build a better country. 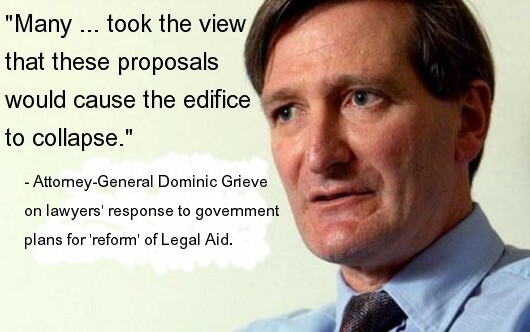 “This government said it wanted to reform the British welfare system. Instead, it has broken it. The proof is here in the desperate families who have had to turn to their GP, not for medicine, but for vouchers to be able to eat. “Instead of supporting the most vulnerable people in Britain during the recession this government has hit them with a wave of cruel cuts and punishments – sanctions, Bedroom Tax, welfare cuts. “The zero hours economy it champions is not enough to put food on tables. It’s done nothing to tackle food and fuel costs. Perhaps you are not affected, like all those new millionaires on whom the Tories are relying. Do you think that makes it all right for this to be happening here? You can use your vote to share your opinion. Vox Political deplores poverty because we live in its shadow. 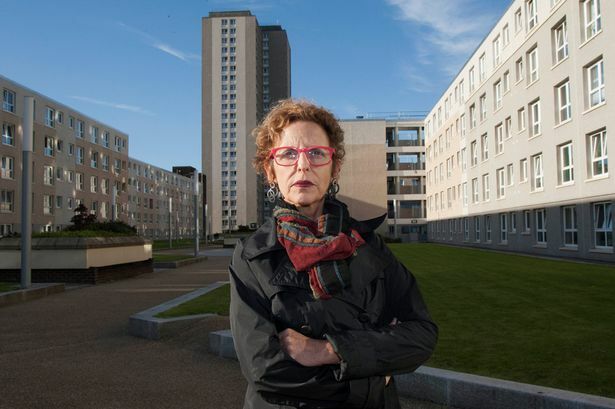 “Public health experts from Durham University have denounced the impact of Margaret Thatcher’s policies on the wellbeing of the British public in new research which examines social inequality in the 1980s. “The study, which looked at over 70 existing research papers, concludes that as a result of unnecessary unemployment, welfare cuts and damaging housing policies, the former prime minister’s legacy includes the unnecessary and unjust premature death of many British citizens, together with a substantial and continuing burden of suffering and loss of well-being. “The research shows that there was a massive increase in income inequality under Baroness Thatcher – the richest 0.01 per cent of society had 28 times the mean national average income in 1978 but 70 times the average in 1990, and UK poverty rates went up from 6.7 per cent in 1975 to 12 per cent in 1985. “Baroness Thatcher’s governments wilfully engineered an economic catastrophe across large parts of Britain by dismantling traditional industries such as coal and steel in order to undermine the power of working class organisations, say the researchers. They suggest this ultimately fed through into growing regional disparities in health standards and life expectancy, as well as greatly increased inequalities between the richest and poorest in society. Read the full article on the Durham University website. … but we do not receive grant funding to publicise its findings. If a Conservative government is returned to office after the 2015 election, there will be yet more spending cuts and service cuts afflicting hard-working, low-paid families. 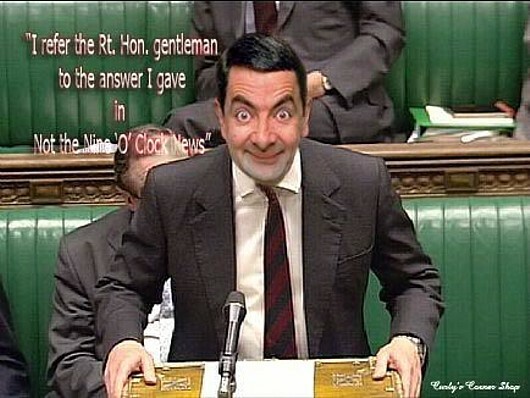 That was the message for most people in George Osborne’s latest attempt at a Budget speech today. There were plenty of groan-worthy moments as the part-time chancellor trotted out the Coalition’s catchphrases: “We will fix the roof while the sun is shining” (groan. The job is taking so long, one has to question whether the contractor is Con-ning the client). “We are all in this together” (groan). Oh really? Benefit spending is to be capped at £119 billion per year, albeit rising with inflation; public sector pay “restraint” will continue for the foreseeable future. This is from the government whose Prime Minister was confirmed, only minutes previously, as having approved 40 per cent pay rises for his special advisors! Most significant is the fact that Osborne avoided mentioning ordinary working people for most of his speech; this was a budget for businesses, with the benefits reserved for fatcat bosses. No major advanced economy in the World is growing faster than the UK, said Mr Osborne; more people are in work. This appears to be borne out by current employment figures (although it should be noted that this is due to a vast and questionable boom in self-employment – the number of employees has dropped by 60,000). Where is the benefit to the British economy? Why has the deficit not been eliminated? Osborne said it stood at £157 billion in the year he came to office, and would be £108 billion this year, but in fact £39 billion was removed due to measures brought in by the previous Labour chancellor, Alistair Darling. He has cut government spending by something like £80 billion so far, but the deficit has dropped by – possibly – £10 billion. Not a good start to his speech. There will be further investment in high-speed rail, even though there is no way of predicting whether this hugely costly investment in making train journeys 20 minutes faster will create any economic improvement. There will be money to fund new centres for medical research – but will these be absorbed by private health firms after the public purse has paid for them? There will be investment in faster extraction of oil from the North Sea – aiming to get as much as possible out before the Scottish referendum, in order to impoverish the Scots if they decide to go for independence? And there will be investment in low-cost energy (finally killing the highly questionable green agenda) – meaning money for shale gas companies, and to hell with the environmental cost. All this investment will go into businesses whose main contribution to the Treasury – Corporation Tax – has already dropped by a quarter (from 28 per cent to 21 per cent) and will go down to 20 per cent this year. This is less than the lowest level of Income Tax. Up go the profits – down go the tax payments. Who benefits? Council tax in England remains frozen, meaning fewer public services. The personal tax allowance is to rise, so people may earn £10,500 before paying tax. This is nowhere near enough to offset the massive drop in living standards that has been caused by the Tory-led Coalition. The cost of living has risen for 44 out of the 45 months of this Parliament – for the whole period, if the earnings of high-paid bankers are removed from the calculation. The threshold for payment of the 40p tax rate is to rise, so fewer people will pay the higher rate. Savers are to be helped but – again – this is not a boost for the poor. Most working and unemployed families don’t have any spare money to put into the banks. How does it help them to know they would not pay any tax on savings up to £15,000 in an ISA, when they cannot afford to open one? And there is a new Pensioner Bond for rich senior citizens (poorer pensioners don’t live long enough to benefit). As Ed Miliband said in his scathing response, the Coalition can afford to give a tax cut of £200,000 per year to bankers who earn £5 million – but can’t afford £250 per year extra for nurses. 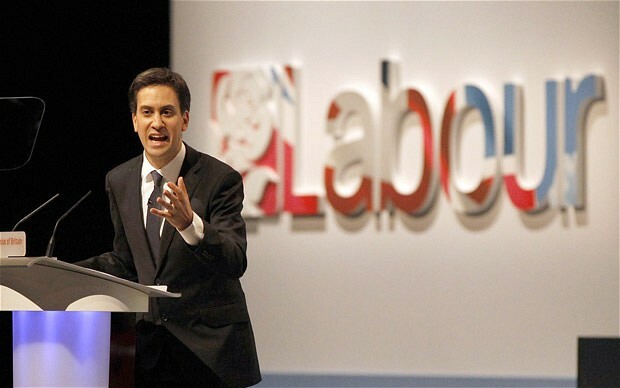 Mr Miliband said the Budget speech was more significant in what it hid than in what it actually said. Working people are suffering under the Bedroom Tax, under cuts to their tax credits, and they are having to visit food banks if they want to eat. This is a government that gives with one hand, but takes back much more with the other. And the Conservatives have the bare-faced cheek to call themselves “The Workers’ Party”. Vox Political won’t earn more than the personal tax allowance. Without YOUR help, we cannot survive. Like it or not, politics in the UK is far more nuanced today than it has been at any time in the last 100 years. How can it be anything else? All the main political parties are trying to occupy the same, narrow, centre-right ground. 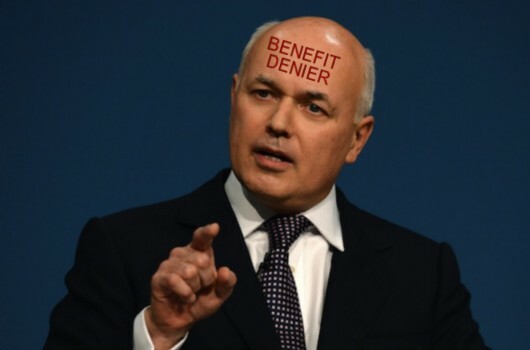 Even so, one man has emerged as the pantomime villain of British politics: Iain Duncan Smith. ConservativeHome readers regularly vote him into the top slot as the most popular cabinet minister – but it seems that anyone who has ever had dealings with his Department for Work and Pensions has the exact opposite opinion of him. He has been nicknamed IDS, but this blog calls him RTU instead – it stands for ‘Returned To Unit’, a military term for serving soldiers who have failed in officer training and have been returned in disgrace to their original unit (the implication being that his claim of a glittering military career is about as accurate as his claims to have been educated at the University of Perugia and Dunchurch College of Management). Here at Vox Political, we believe that this man’s tenure at the DWP will go down in history as one of the greatest disasters of British political history – not just recent history, but for all time. It is our opinion that his benefit-cutting policies have done more to accelerate the impoverishment of hard-working British people than the worst recession in the last century could ever have done by itself. We believe the assessment regime for sickness and disability benefits, over which he has presided, has resulted in so many deaths that it could be considered the worst genocide this country has faced since the Harrowing of the North, almost 1,000 years ago. That will be his legacy. On Sunday, he will appear on the BBC’s Sunday Politics show to answer your questions about his work. The show’s Facebook page has invited readers to submit their own questions and this seems an appropriate moment to highlight some of those that have been submitted – but are never likely to be aired; RTU is far too vain to allow hyper-critical questioning to burst his bubble. There were many more questions that were not appropriate for repetition. To see what he does have to say for himself, tune in to Sunday Politics on BBC1, starting at 11am on March 9 (which is, as you might have guessed, Sunday). Just don’t get your hopes up. Is anyone stupid enough to fall for this Tory tax bribe? So David Cameron wants us to believe further public spending cuts will be used to ease the tax burden on the proles, does he? He must think you’re stupid. Are you? Exactly one month ago (February 5), the Institute of Fiscal Studies reported that Cameron’s Coalition government will be less than halfway through its planned spending cuts by the end of the current financial year, as Vox Political reported at the time. These are the cuts that the government considers vital in order to bring the nation’s bank account back into some kind of balance in the near future. If Cameron abandons the “long-term economic plan” his Tories have been touting for the last few months, in a bid to bring voters back on-side, it means he will want to make even more cuts if he is returned to office in 2015. There will be no tax cuts; he is lying, in the same way he lied about keeping the NHS safe from private companies – the same way Jeremy Hunt has lied about your medical records being kept away from companies who will use them to raise your health insurance premiums, and the same way that Iain Duncan Smith has been hiding the true extent of the deaths caused by the Atos- (sorry, OH Assist-) run work capability assessments. He will make a few tax cuts (probably in the March budget) but any benefit will be clawed back as soon as the Tories have secured your votes and won another term; the only people they want to help are rich – and you don’t qualify. According to yesterday’s (March 4) BBC report, “every efficiency” found could help provide a “bit of extra cash” for households. But we already know from the BBC’s article about the IFS that “additional spending, population growth and extra demands on the NHS meant more cuts were needed”. Which are you going to do, David? Give money back to the people in tax cuts or tackle the deficit? If you want to achieve your goals within the time limit you have set yourself, you can’t do both! Not that deadlines mean anything to him, of course. As noted in the earlier Vox Political article, it is more likely that the Conservatives have been working to give themselves an excuse for more cuts, rather than to restore the economy and balance the books. And if he does cut taxes, what public services will we lose forever as a result? Don’t let this liar make a fool out of you.